One of my mentors, Jeanne Stenfort, has gone home to be with the Lord on February 15, 2014. The invitation to her memorial services quoted a very fitting verse. "I have fought the good fight, I have finished the race, I have kept the faith" (2 Timothy 4:7). Jeanne Stenfort is the beloved director of the Silicon Valley chapter of Child Evangelism Fellowship (CEF). She was also responsible for the Children Ministry and Early Childhood workshops at BASS. Even with cancer, Jeanne remained faithful in serving the Lord. 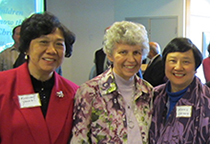 Two years ago, on March 25, 2012, I attended a Ministry Reception in honor of Jeanne and saw my friend Millicent and the parents of my daughter-in-law there. I e-mailed Jeanne some photos the next day with these words. "Dear Jeanne, Praise the Lord for who you are and what you have done in Christ. You have helped so many kids of all ages. Thanks for teaching me, encouraging me, and introducing me as a BASS workshop leader. You will always be my treasured mentor. What a treat it was for me to sit with Millicent at your reception. She learned from you at least 10 years before me, and she recommended me to take the Teaching Children Effectively (TCE1) class in 1994 at the Salvation Army, San Jose... Both of you have trained me in children's ministries. Both of you have demonstrated faithfulness in the Lord and provided encouragement and support through the years. You blessed me and my family..."
Jeanne has touched and changed many lives. No doubt we will all miss her greatly. Please pray for her family and friends during this time of grief and loss. I'm grateful to have the chance to say to Jeanne what I wanted to say before it was too late. Pray that many will continue to press on sharing God's Word and His great Salvation to the children in Silicon Valley, and around the world.